Safari Uganda to East Africa’s adrenaline capital; Jinja for the best Africa adventure safaris. Jinja is home to some of the world’s finest grade 5 white water rafting on the world’s longest river Nile. River Nile has been developed into a world-class rafting destination. The Nile river possess some of the most prevailing and constant rapids on earth. River Nile’s powerful volume of water generates awful rapids that provide an unforgettable rafting experience comparable to that of the Zambezi River in Zimbabwe. The White Nile has up to 7 times the volume of the Zambezi. 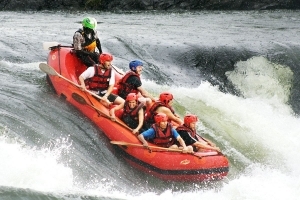 White water rafting is widely regarded as the finest one-day Uganda safari activity on planet earth. White water rafting is high on many people’s list of things to do in Uganda. This is the safest and most popular expedition down the Nile. White water rafting is exciting, challenging fabulous rapids in the hands of those who know the river best. White water rafting is perfect for Uganda adventure safari for first-timers, families and high adventure fanatics. The stretch of the Nile used for rafting covers around 30km with rapids ranging from grade 1 – 6 although the rafts only go down grades 1 to 5. River Nile gives you beautiful views of wildlife normally spotted along the river during rafting as well as many species of birds, monitor lizards, fish, as well as local fisherman in their dugout canoes. The adrenaline capital of Uganda, Jinja offers not only white-water rafting, but also adventurous activities safari like bungee jumping, kayaking, mountain biking and river boarding. For the young, old, families or not so adventurous, this is a great trip for anyone who wants to have a milder rafting experience known as the family float. This is the ideal trip for anyone who wants to enjoy the natural beauty of this impressive lake and river system, but don’t want to do any of the big rapids. 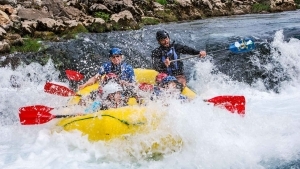 Clients do not need any earlier rafting experience. The guides train the clients on all parts of safety and organize them for a memorable experience. Be among the first to be familiar with the incredible adventure and excitement of the Nile water rafting from this point of Bujagali falls. While rafting is a dangerous sport, these rafting operations have been made as safe as possible. Rafting the Nile has 100% safety records. Every grade 3 and grade 5 trip has safety kayaks and a safety raft, with expert guides who are first aid trained. Clients can enjoy the rafting knowing that they are in the safest hands. Top quality safety equipments and highly qualified and experienced guides run the largest rapids possible. These include; a life jacket and safety helmet as well giving them a comprehensive safety briefing.